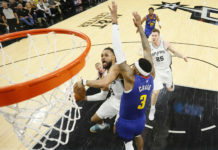 It is seeming more and more likely that Denver Nuggets starting shooting guard Gary Harris will return to action against the New Orleans Pelicans on Friday night at Pepsi Center. Getting Harris back will be a welcome addition to a Nuggets team that, most recently, was only able to muster 82 measly points against the Portland Trail Blazers. 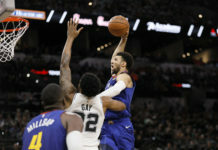 After practice on Wednesday, Harris broke the good news that he had gone through practice and is now aiming for Friday’s matchup with the Pelicans as the date for his return to the hardwood. 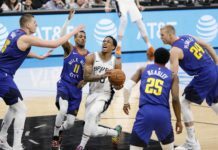 The injury to Harris’ right shoulder goes back to Nov. 9, when the Nuggets were able to secure a statement 102-94 win over the Oklahoma City Thunder at Pepsi Center. Harris did not come out of the game at any point because of anything that resembled an injury but, according to him, the discomfort in his right shoulder kicked in after the game. Whenever you hear the words “I could not even lift my shoulder” come out of a player’s mouth, it should be an immediate cause for concern, which is why Harris missed the following two games. The total time Harris will have rested and received treatment for his shoulder will end up being eight days spanning from Nov. 9, when he first hurt his shoulder, all the way until he takes the floor against the Pelicans on Nov 17. While Harris did miss two games due to his right shoulder, it does not seem like there is any long-lasting concern from the Nuggets — or Harris himself — when it comes to the injury. The Nuggets did not even have Harris get an MRI on his sore shoulder. Nuggets head coach Michael Malone was excited by what he saw from Harris during Wednesday’s practice — Harris’ first practice since injuring his shoulder. Hearing Malone say he would be surprised if Harris did not play on Friday against the Pelicans is huge for a Nuggets team that is still trying to figure themselves out. In the time that Harris has missed, Denver was able to beat up on the Orlando Magic to the tune of a 125-107 victory, but followed that win with a sloppy and uninspiring loss to the Trail Blazers. Denver was only able to gather 82 points against in Portland as their offense fully malfunctioned for 48 minutes. The Nuggets eventually lost 99-82 and fell to 8-6 on the season. Hopefully, getting Harris back will also get the Nuggets back on the track. The relaxed and calming aura that Harris carries with him in everything he does helps keep the Nuggets’ roster mellow as a whole — especially when the going gets tough, like in Denver’s most recent loss to the Trail Blazers. That calm and consistency that Harris plays with were greatly missed against the Trail Blazers as the Nuggets offense failed to find any rhythm and every possession felt uncertain. Having a level of consistency — Harris’ level of consistency — can alter the mindset of a young team. Knowing exactly what Harris will do each night can leak into the rest of the roster and calm situations that could be chaotic otherwise; similar to how Harris’ off-ball cutting became infectious. Malone has also been aware of what the Nuggets have lost on both ends of the court in the time that Harris has been sidelined with his sore shoulder, even when considering how terrific Will Barton has been replacing Harris in the starting lineup. Harris potentially returning to the fold will lead to a multitude of positive situations, the biggest of which is allowing Barton to slide back into his bench role. Against the Magic, the first game that Harris missed, the Nuggets’ bench only scored 26 of the teams’ 125 points. It was even worse in Portland, where the Nuggets’ bench scored a minuscule 14 points. To put the bench woes into perspective, the Nuggets’ backups, without Barton, scored a total of 40 points in the last two games combined against the Magic and Trail Blazers. The Nuggets bench, with Barton, scored 49 points in the win over Thunder alone. Getting Barton back with the second unit will be a huge boost to the team as a whole. Harris is also a huge loss offensively for the Nuggets’ starting five. 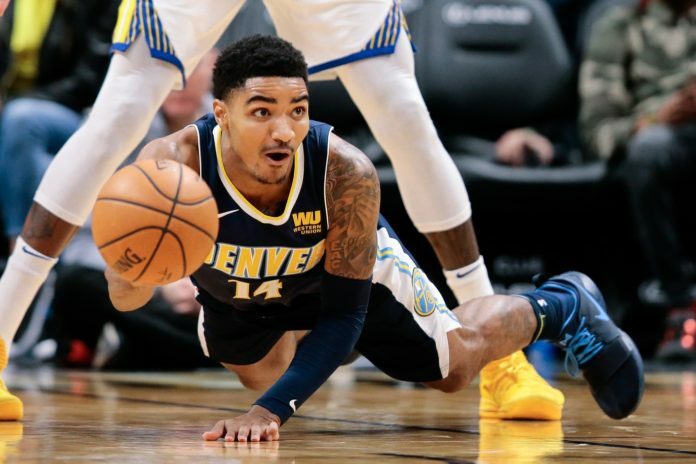 His off-ball cutting combined with his lethal outside shooting allows maximum spacing from the shooting-guard position within the Nuggets’ offensive scheme. While Barton is a great offensive player himself, Harris just happens to be stylistically ideal for the Nuggets’ offensive scheme. Getting Harris’ cutting and shooting re-integrated into the offense should help open things up for Nikola Jokic and Millsap to get back to being the playmaking frontcourt combination that the Nuggets were hoping for. Obviously, Harris’ defense has also been missed. Denver was able to hold the Trail Blazers to 7-for-21 from the 3-point line, but they struggled to keep the wings and guards of Portland out of the paint. Against the Magic, the Nuggets allowed Orlando to shoot 35.5 percent from beyond the 3-point line on 31 attempts. Getting Harris’ defense back would be a massive boost, and Malone even dove into the advanced statistics to show how badly Harris has been missed. Thankfully, Harris’ shoulder injury does not appear serious. Now that it seems like Harris will be returning by Friday night’s game against the Pelicans, Malone has already presented Harris with his next challenge: Becoming more of a leader of the Nuggets.